Looks nice! I like thai curries, I just wish sometimes that they were thicker in consistency. This is a bowl of warmth and comfort! I would love some too. 😀 Yum! I can’t wait to try your soup, tho! 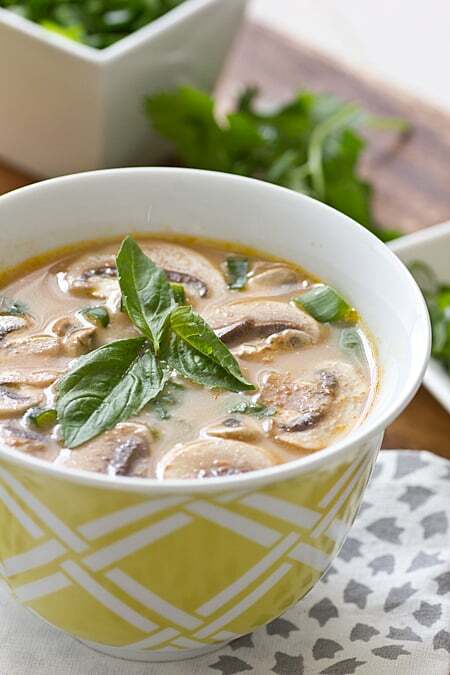 what a delicious thai soup! i love red curry, it’s so comforting and warming. i hope you feel better soon. yay for soup week! my hubby would be so into this!! 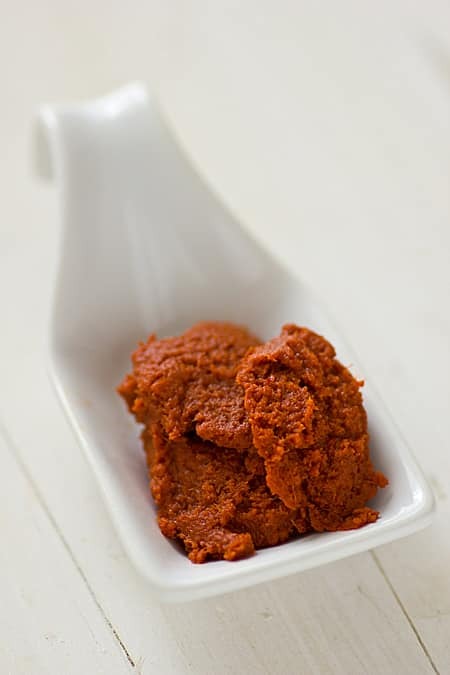 I love red thai paste…and green thai paste too. Yummy soup! Where is the receipe for the polenta veggie bake you mentioned?? Yes, I want to do more Asian cooking too! I don’t know why it intimidates me so much. But this soup is easy peasy. 🙂 I hope you like the polenta bake! What a beautiful blog! So happy to have discovered you. Yum! There is an authentic Chinese dine-in restaurant in Charleston (on Daniel Island) called Dragon Palace and they have *the best* hot and sour soup that I love eating it when I’m sick!!!! I have all these ingredients in my fridge. Can’t wait to try it! We love Thai cuisine. Wowee, that looks amazing! Tomorrow i already promised to make ‘thé Ratatouille’ but the day after, i sure would love to try you soup! A spicy soup like this is just the kind of thing I reach for when I’m feeling sick too. Hope you are on the mend soon! 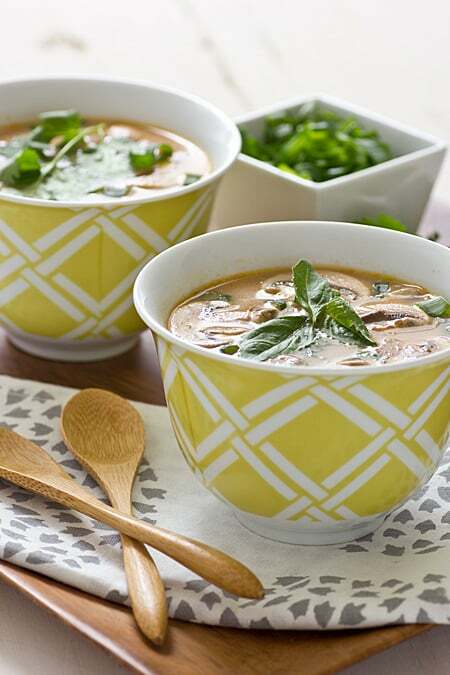 Red curry soup is my favorite and I absolutely love your version of it! Looking forward to more soups! Yay for soup week! This is definitely a must-try in my book since I’m completely obsessed with thai curry! I love curry anything! And there are those glorious mushrooms again. I am going to make a big batch and eat it for lunch all week. I had it for lunch a few days too–it makes big servings! I always think of Asian style broths being very complicated and requiring lots of ingredients, but this recipe actually sounds pretty simple! And I’m used to adding brown sugar (or palm sugar) to Thai peanut sauces, so I bet it adds the perfect touch here too! Hope you’re feeling better by now! I’m behind in going through my inbox so just seeing this recipe and YUMMY! I love coconut and curry soups. I make a similar one with snow peas. YUM! This looks so good, and simple too, I know it will please the meat eaters in my family! Thanks for posting! I also blog about the vegetarian lifestyle, specifically high protein and energy boosting nutritional habits if you are interested: http://theliverlyvegetarian.blogspot.com. Thanks for all the great ideas and for promoting a healthy lifestyle! I love soup in the winter time. The recipe sounds lovely! May I ask where you got the adorable bowls? !